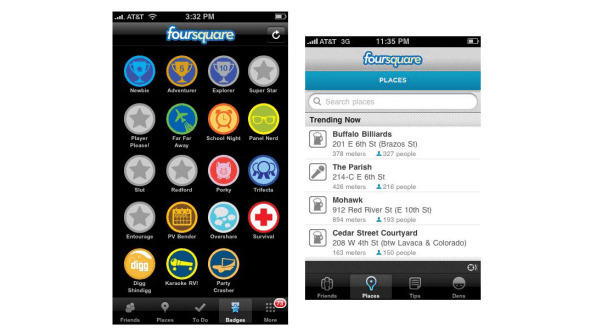 On March 11, 2009, an iPhone app called Foursquare formally debuted at the SXSW conference in Austin. It let you explore a city by “checking in” to restaurants, bars, and other physical locations, competing with your friends to rack up badges and “mayorships.” The app was a phenomenon at the show—much as Twitter had been a couple of years earlier—and soon became a much-imitated App Store hit. 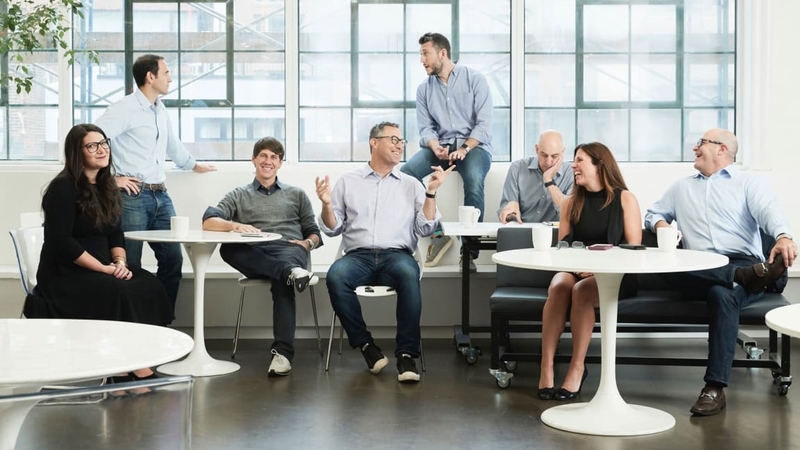 A lot has happened at Foursquare over the subsequent decade. Instead of either selling out to a big company or fading away, as many another hot startup launched in 2009 did, Foursquare stayed independent and evolved. It ended up carving off the original check-in feature into a separate app called Swarm, and found a business model in providing location-related data to companies such as Apple, JetBlue, Target, Twitter, and Uber. I recently chatted with cofounder and executive chairman Dennis Crowley about Foursquare’s story to date, including its return to SXSW—after a few years’ absence—with a new feature called Hypertrending. This conversation has been edited for publication. Fast Company: We should start by going back to SXSW 2009 and the experience of launching there. Dennis Crowley: Everyone remembers it as, “Oh, we had a big launch at SXSW in 2009.” When really it was just me and my cofounder [Naveen Selvadurai] kind of hacking away on this prototype in my apartment in the East Village. And then we got on a plane and we didn’t even have passes to the conference, but the idea was to show people what we’d been working on. 2010 was a much bigger deal. And then I think we went every year for four years. And then this year will be the first time I’ve been there in probably six years or so. FC: Was that a happy surprise that people at the event loved what you were doing? Did you expect that or try to orchestrate it going viral? DC: To be honest, I remember feeling very self-conscious about the app that we had made. Because Foursquare 1.0 was a little bit of a game with the badges and the mayorships and checking in and the city guide. It was a lot of stuff mashed together. And we actually thought people would think it was a dumb idea. But they didn’t. People loved it. And it was much better received than we expected it to be. We went from having a hundred users in New York City to leaving Austin probably with 4,000 or 5,000 users. That was really kind of the kickoff for the company. We came back being like, okay, this is interesting enough that we should continue plugging away. FC: You had something that helped people get more out of SXSW. DC: Back then we used to refer to SXSW as a glimpse into the future. Where everyone that you met was using Twitter. Everyone that you met was going to check in to a place. Everyone that you met had a camera phone. This is 10 years ago, so it’s crazy to think about back when not all that stuff was accessible. But everyone was using all of this stuff all the time [at SXSW]. Which is why it became a great place for other companies to launch things, because everyone was willing to play with prototypes. DC: In 2010 we launched things at SXSW, in 2011 and 2012 we launched things. We always had something to launch just because it was part of the company’s history and legacy. And then we just stopped doing it because the company really got too big. We were so busy building things for tens of millions of people all around the world that, it didn’t make sense for us to do launches at SXSW. And so we are showing off a demo that we call Hypertrending. The original Foursquare had a feature called trending. It would show you how many people had checked into a place. And what Hypertrending does is it measures how many people we think are at each place based upon our global panel and our understanding of the traffic trends in and out of different places. So it’s like a super, beefed-up, futuristic version of some of the stuff that we showed off in 2009 and 2010. Two early Foursquare screens showing it in use during SXSW. FC: When you were new and hot, all of the sudden there were many other apps doing something kind of similar to what you were doing, most of which went away really quickly. Why did Foursquare gain traction and all these other check-in apps not go much of any place? DC: I think it’s two things. The first is we were the original and not a knockoff. We always had a vision for what we wanted to build, and that kept us from being distracted. Our thing was, listen, the point is not to build a check-in app. The point is to build these services that feel magical because of all the data that they have. Remember, Foursquare is my second company. I had a company before this called Dodgeball. We sold it to Google, but Dodgeball was check-ins on text messages. We had gone through that ride before and we were already convinced that, hey, check-ins are interesting. We need to get a lot of them so we can do the next thing. FC: Five years into Foursquare, you went through this change where you split off check-ins into Swarm. Was that something that you thought about doing early on? DC: There was a moment where Foursquare and the idea of checking into places was becoming less relevant to people because of things like Instagram and the likes of Twitter and Snapchat. There were sexier things to do. And we had recognized that, but we still had lots of people that wanted to use the products to search, and still had lots of people that wanted to use the check-in product. But when they were the same thing—when they were one product—you’d have a lot of people say like, “Oh, this just isn’t for me,” and they would stop using it. And so that led up to the conclusion that we should have two products, each one with a very specific purpose. So it split the user base. But it split them into apps that enabled us to create better versions of those apps. Foursquare City Guide now is a much tighter version of the City Guide product. And Swarm is a much tighter version of a check-in product. FC: That was controversial among some users at the time. Are you still comfortable that that was the right decision to make for the business? DC: Yeah, because we’re not based off of the number of check-ins that we get. We’re not based off of the number of photos that people upload, or the searches they do. The company has moved away from this idea of needing to monetize the user base. And instead, the revenue model is based off the licensing of data, tools, and technology. An amazing piece of technology called Pilgrim is the crown jewel of what we built here, which is the ability to sense where the phone has moved in or out of a place without someone having to press a check-in button. We can put that in our own apps and do interesting things with it. We help other companies embed it in their apps so they can help their own users understand the way that they move through the world. Both those things together generate lots of data for the business, which helps us have insight into where people are going and to be able to predict trends in places and neighborhoods and create really interesting advertising products. 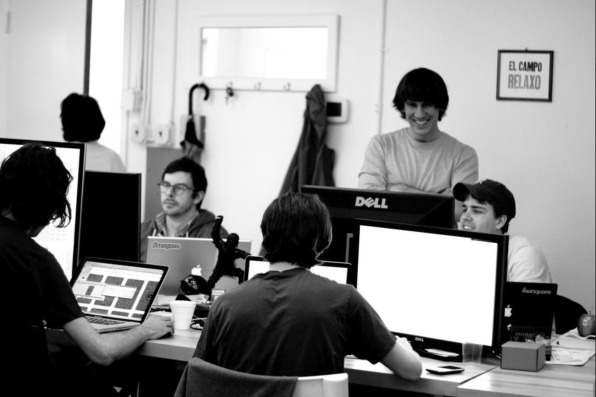 Dennis Crowley (standing at right) at Foursquare headquarters in 2010. FC: You talked about the fact that you have a lot of data, and I know that you believe protecting the data of consumers who use your apps is important. Can you talk a little bit about your philosophy and your practices in terms of what you do and don’t do with the data you have? DC: There’s a lot of people that are looking at the location technology phase, a spectrum of good actors and bad actors. We’ve always fashioned ourselves to be one of the good actors. We have data, we anonymize it, we aggregate it before it’s shared with any partners. We’re very thoughtful about the language we use about opt in and opt out. Our general belief is that users own the data; they should be able to do what they want with it. This DNA is built into the company, and I think it comes from doing this for a long time and starting with building with consumer products and wanting to build products that people love and trust. We were at Google during the Don’t Be Evil days, and I think that ethos is kind of baked into all that we’ve done from the very beginning. FC: And has that been helpful today, now that we’re in an era where consumers are more concerned with their data, especially when that data involves really personal stuff such as their location? DC: I think people are just starting to become aware of, “Wait wait, Facebook does something with all the likes that I have?” Even that is big news for a lot of people that don’t work in tech. And I think that’s going be true for all apps across all categories. People are just starting to look under the hood at a lot of these location services and advertising technologies. We’ve been pretty outspoken in terms of, Hey, this is our methodology. This is how we collect data. This is how we anonymize and aggregate things. We consider ourselves to be one of the best actors in the space, and so we have no problem talking about our practices and the things that we do, and the things that we don’t do. FC: Foursquare and Swarm have 50 million users [on a rolling 60-day timeframe]. Is that a happy number, in terms of you being able to get the data you need for your business purposes? You don’t need a billion people? DC: That was one of the key insights that the company had over the last five years. Around the time we split the apps, we realized that we weren’t going to get to a hundred million users. It’s just not in the cards for us with these niche products. We had to find another way to monetize the assets we had. We had the epiphany—it sounds so stupid to say this—that we should ask the people that are using our API to pay for the API usage. That was a controversial thing, but we went out and we talked to developers, and they said, “Of course we’ll pay for it.” That was the beginning of our understanding that it was possible to continue building and growing and evolving this company, but to do it with more of an enterprise sales model, rather than straight-up consumer advertising. FC: You didn’t need even a hundred million people using the apps for the data to be super useful. DC: These days, with the amount of technology and data that we have, and our ability to normalize things through data science and machine learning, we can get a good sense of what’s going on in lots of parts of the world with a modest-sized panel. We don’t have to have a billion users to be able to understand what a billion users might be doing. FC: Foursquare has been part of the New York tech community for a decade now. You never got acquired by some large company, and you’re still around and thriving. Can you talk about experience of being in New York for a pretty long amount of time? DC: I’ve feel like I’ve lived through almost all the stages of New York tech. I moved to the city in 1998, at the tail end of the dot-com bust. My second job ended because I got laid off during the dot-com bust. I lived through that period where there weren’t a lot of new startup businesses, but there was lots of interesting innovation; I was at NYU at the time. My first company, Dodgeball, came out of some of that work. And then we decided to do Foursquare a couple of years later, and we decided we were going build a tech company in New York. Everyone thought we were crazy: “It’s impossible, there’s not enough engineers here, you’ll never be able to do it. How much longer until you move to San Francisco?” We just decided we were just going to make it here; we didn’t want to move out west. It wasn’t just us. It was us and Etsy and Tumblr, a small cohort of startups then that were trying to make it work. 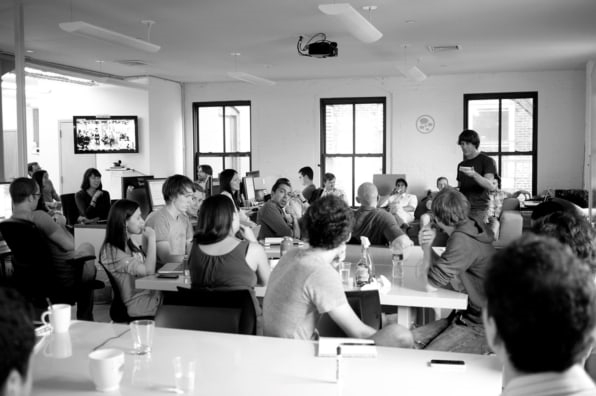 A 2011 company meeting at Foursquare’s New York headquarters. The three of us doing it led to three more, then 10 more, then 20 more startups in the space. That started attracting more venture capitalists. There used to only be half a dozen VCs with offices here in New York; now there’s probably 50 of them. And I think we owe a lot of credit to Google for opening that huge engineering office when we were working at Google. Our first 20 hires, I think, all came from Google. They were all the people we used to sit at the lunch table with. It’s at the point now where it’s not going to go away. Tech in New York is just a part of New York City now. FC: What’s the talent pool like for hiring these days? Is it radically different than it was in the early days? DC: For sure. In 2009, ’10, ’11, ’12, we were the big fish in a small pond. And then once Twitter was like, “Hey, we should have an office here” and Facebook was like, “We should have an office here,” and Snapchat was “We should have an office here.” It just turned into a different game. Because these are big public companies that have more resources, in terms of salary and liquid stock, so it’s harder to compete. But the tech ecosystem here is still very healthy. There’s plenty of people that don’t want to work at a big company. They want to be able to contribute in a large way to a company that still only has 300 employees, like us. FC: And is Foursquare as a product and a company meaningfully different than it would have been if it had moved out to San Francisco at the get-go? DC: You know, you asked earlier about why we were able to survive and all the other copycats weren’t. And my answer was “We had this clarity of vision, blah blah blah.” But another thing I always think of is, we’ve been a location technology company from the beginning, right? It’s our job to figure out which place a phone goes into, and one of the hardest places in the world to do that is St Mark’s Place, and that’s because there’s businesses on top of businesses, and they’re all pretty tight; some are upstairs and some are downstairs, and some are inside other places. St. Mark’s is three blocks away from Foursquare headquarters, and that’s where we went to test everything. It always felt like we were building for a really, really hard city without realizing it. People that were building in San Francisco or building in Austin, for example, were dealing with more spread out, urban sprawl type of environments that weren’t as dense as what we were building for. I think that really gave us an edge, as we were forced to solve hard problems. FC: You talked about how you discovered the Foursquare was not about having a consumer product with a vast number of users, but you have continued to add new features to the apps. You experimented with a recommendations bot called Marsbot. You’re introducing Hypertrending. Can you talk about the state of the consumer apps even if they’re not the end-all of what you’re doing? DC: It’s kind of humbling to know that people still use the stuff that we made 10 years ago. We have the City Guide product and we have the Swarm product. And we’re kind of at the point now where we don’t want to change them too much. Because people like what they do and they do it really well. And we can continue to improve them, but we don’t need to reinvent them. That said, we are always making new technology here and the technology is always getting better, mostly in service of a lot of our enterprise tools. But we recently soft-launched this R&D lab called Foursquare labs. And this is what I work on. The thing that we’re experimenting with now, this Hypertrending product, that’s kind of the same thing: “Let’s give people a Doppler radar view of where all the phones in Austin are and let’s see how that changes what people do, where they go.” It’s a way for us to learn and evolve our own thinking about what we should be doing and what we should be building. FC: As you mentioned, you sold Dodgeball to Google. And then you turned some of the same ideas into Foursquare, and never sold it; you’ve been exploring this idea for a decade. Can you compare and contrast between those two experiences? DC: Dodgeball was a great outcome for us at the time. Because we were NYU students and we really just needed to pay our rent and stop eating pizza all the time. We went to Google and we had all these dreams of what we’d be able to build. But we just could not figure out how to exist and be productive in a large environment like that. And there’s a thousand reasons for that. Some of them were our fault and some of them were just Google in 2005. Foursquare has been a super challenging journey for me. I’ve never had a job that lasted 10 years. This job is the most rewarding thing and the most frustrating and crazy thing I’ve ever been a part of. But at the same time, you have these moments. We’re having one of these moments now. We’re building this thing called hypertrending. No one’s ever done it. There’s no other company that can do it. There’s no other company that would even try to do something like this. But this is what we do. We have this crazy technology. We have this super interesting data set. We’ve got all these awesome employees. We have all the infrastructure we need to build this quirky stuff. And it’s almost like, 10 years in, you earn your seat at the table to help invent the future.